Hobby drone aircraft are common, but there are no others on the market like the Quadxie, available from Ashima Devices. You can check them out on Ashima's retail outlet site: Quadxie. All Ashima Devices' flight control systems are developed vertically, which means that they don't rely on the hardware or software of outside developers. Ashima Devices is a high tech company located in Pasadena, California, just down the street from Cal Tech. The Quadxie is a 3D printed, compact flyer. With four high-speed ducted motors, it’s crazy powerful. Yet because the motors are enclosed within the body, you can safely get close to the Quadxie and even take off and retrieve by hand. The flyer comes in two versions: one that fits a 720p/1080p Polaroid Cube camera and one that will accommodate a FatShark camera and 5.8GHz live feed transmitter. 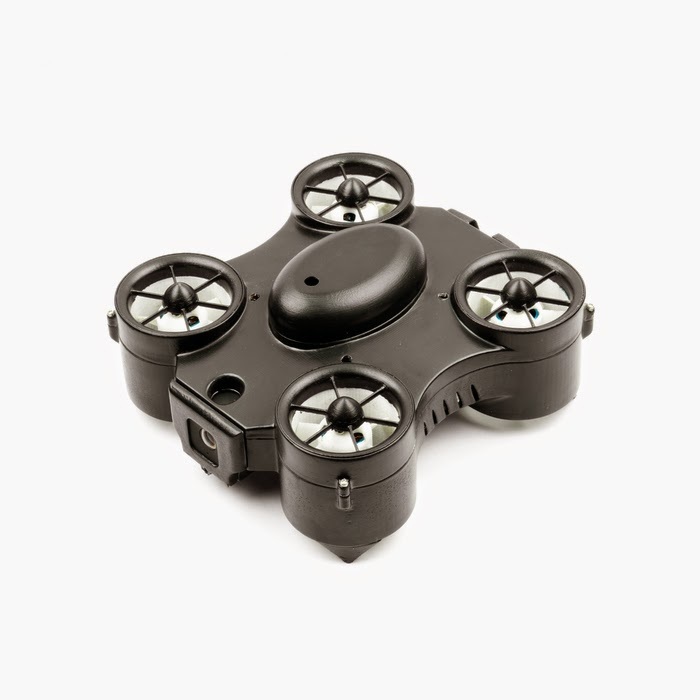 The Ready-to-Fly system comes complete with a 4-channel transmitter and a 3.2Ah battery. The hull form that I am holding (right) is essentially the Quadxie, wrapped in fuselage designed for Nikon.